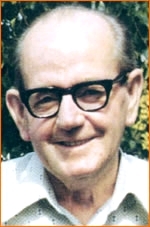 Bowen Therapy takes its name from Thomas Ambrose Bowen (1916-1982) who developed the technique in Geelong Australia. A technique which produced profound results for the thousands of people he treated each year. He had an uncanny knack of assessing just what "moves" a client needed and to apply them quickly and accurately, needing to spend only a short time with each, to determine and apply the appropriate "moves". He didn't advertise, with all of his thousands of clients, coming via word of mouth referral. Neither did he document his methods, but over the years six students 'studied' under him, each over a lengthy period of time and it is from these students that Bowen Therapy, and its many derivations, have come to us today. In fact in less than 30 years, Bowen Therapy has spread around the world with thousands of therapists now operating in nearly a 100 countries. We owe Tom Bowen a debt of gratitude, since without his; perseverance, tenacity, dedication, generosity and goodwill, we would all not be potentially benefiting from his legacy. "EVERY 'BODY IS BETTER WITH BOWEN"